Offers: Contact club for detail of any prevailing offers. Local agents offer discounted tee times. 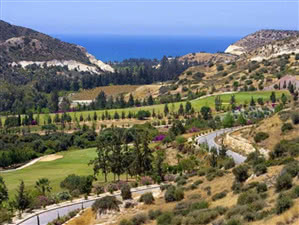 The Secret Valley, located in the famous Petra tou Romious (birthplace of Aphrodite) and opened in 1996, is generally considered the most pretigious golf resort on Cyprus. The course nestles into a scenic valley which is surrounded by mature trees. The fairways meander through and along the valley with panaoramic views seemingly at every turn. The first few holes are reasonably gentle but the back nine are much more challenging. However, with the use of multiple tee positions this always well maintained course offers a challenge to golfers of all ability.